Find your new home in Riviera Freehold, an upscale active adult community. Riviera Freehold is an upscale, gated Active Adult community in Freehold Township. People love the location, because it’s close to shopping malls, dining, theaters, beaches, libraries, museums, and much more. The association will take care of the lawn maintenance and snow removal, consequently, means you don’t have to. Furthermore, parks, golf courses and the Jersey Shore are minutes away. And it’s easy to enjoy the free concerts in either Freehold Boro or at Raceway Mall in the summer. Live theater in Red Bank and concerts at PNC Art Center will provide many hours of entertainment. Between 2004 and 2006, about 300 single family homes in Riviera Freehold were built by Toll Brothers . The homes have either 2, 3 or 4 bedrooms, high ceilings and a 2 car garage. In addition,some homes have a loft. Home sizes are between 1855 sq ft – 3278 sq ft. Decorative moldings, 8′ doors and open floor plans combine to give a sense of elegance. Additionally, the detail work in a Toll Brothers house is unparalleled. 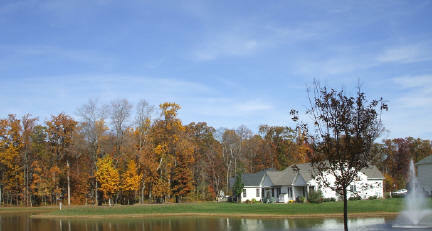 Many of the homes offer a water view of one of the five ponds or lakes in the community. There is a 12,000 sq ft clubhouse in Riviera Freehold. In the clubhouse you’ll find concierge service in addition to indoor and outdoor pools, a health club and a library. A variety of activities is available to residents and guests of Riviera Freehold. Or you can simply stay in Riviera Freehold and relax at the clubhouse with your friends. Also – the Freehold Senior Center is less than one mile away. While Riviera Freehold doesn’t have a golf course, there are many golf courses in Monmouth County. Residents of Adult Communities in Monmouth County can take advantage of the Monmouth County Senior Citizen and disabled adults Transport bus. This bus service takes people from each community to local shopping centers such as malls and supermarkets. And it usually brings you back! This is a free scheduled service from Monmouth County.. Another service is a medical transport bus that will take people to any medical facility or doctor’s office in Monmouth County. These trips must be scheduled in advance, however there is a nominal charge for this service. Commuters love Riviera’s location because New Jersey Transit offers bus service on Route 9, which is within walking distance.